Where have I been? I have been on vacation. 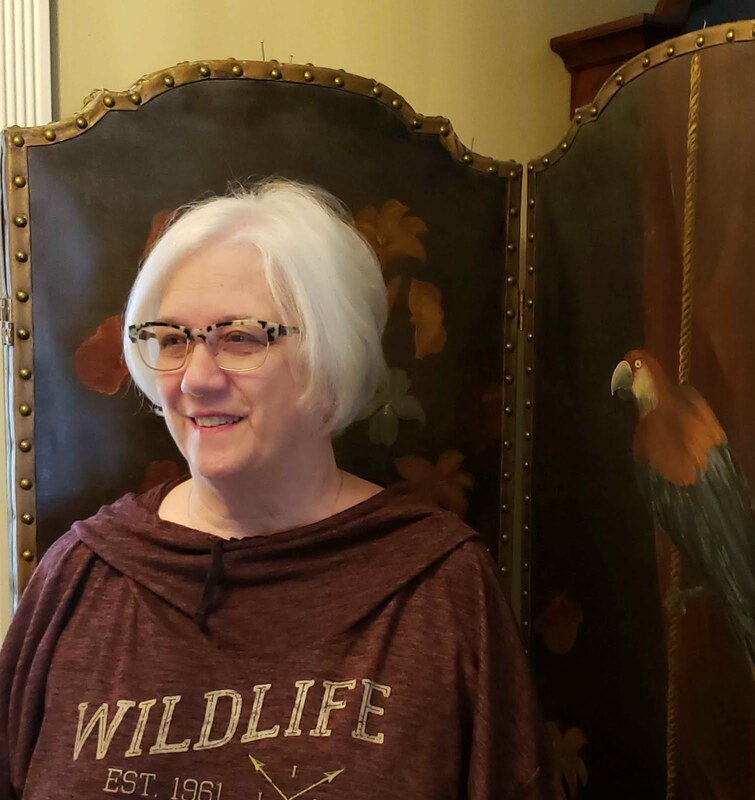 I returned about a week ago but I can't get into blogging mode. This is sort of how I feel. A little wonky. I wouldn't call it jet lag just somewhat out of sorts. How can a vacation do this to you? Must have been the winds. On the other hand all seems well and good in the garden. Today I decided I should at least give a report about what is going on in the garden this time of the spring. This post is a little picture heavy. What with all the usual suspects giving their best blooms. 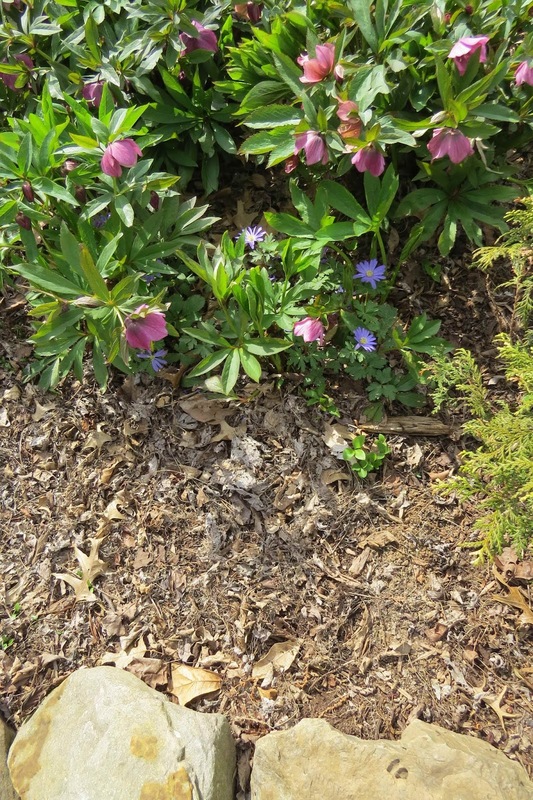 I must say that the daffodils and hellebores aren't as floriferous as they usually are. 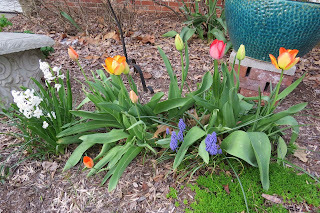 This it the first time I ever remember the freezes and thaws took a toll of blooms but I still have enough blooms to make it feel like spring. 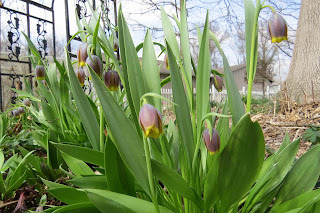 Some of the other bulbs like these frittilaries have done exceptionally well. 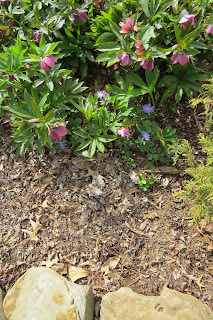 I must remember to move the windflowers out of the hellebores this fall. 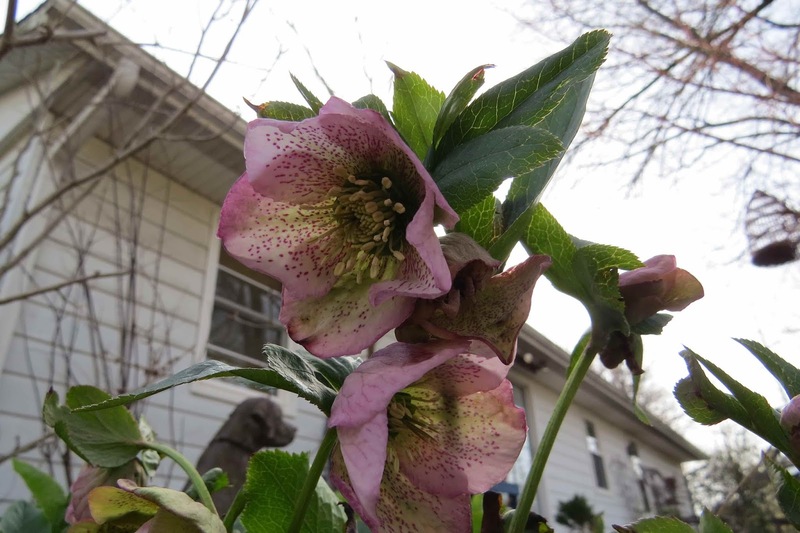 Or thin the hellebores might be a better choice. 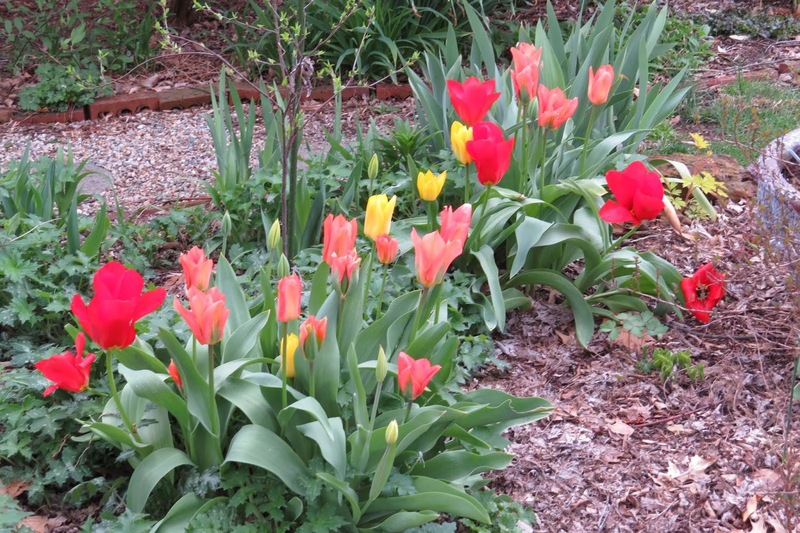 My attempt at red white and blue out front was thwarted by some red & yellow tulips that were mixed in. No matter I think they are all just fine together. More tulips out back. It seems that the paler tulips are reproducing and the reds are not. 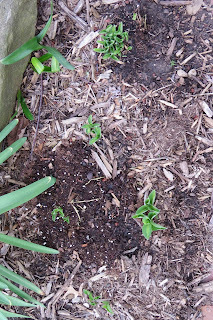 My last report stated that some of the mini hostas were heaved out of the ground. They have recovered for the most part. I was pleased to find these seemly fully recovered. Grow mini hostas! 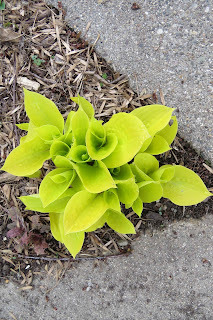 Below is a hosta I just love in the spring. It comes out all bright and cheery. Then into summer it loses some of it's bright yellow color. 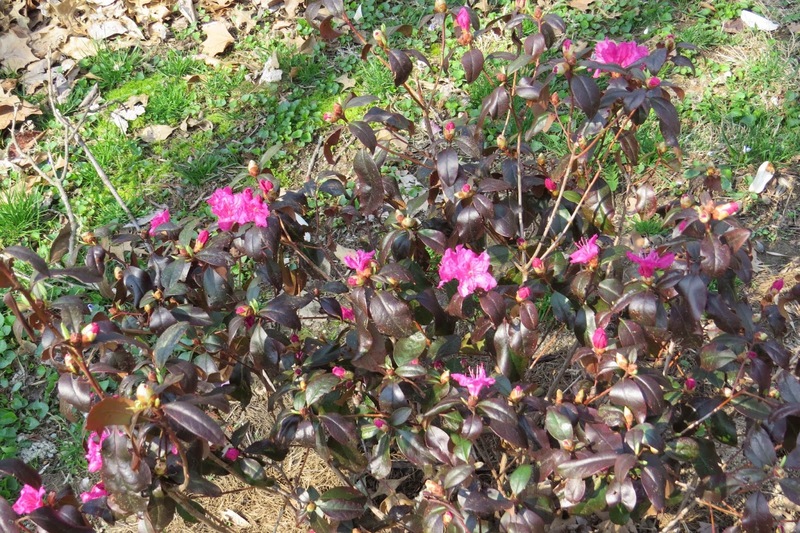 I can't remember the name of this one and I have checked my records and I can't pin point which it is. Hmmmmm Oh well, I will just ogle it and not worry about it's name. Our Azalea is beginning to bloom. This is always such a nice sight. 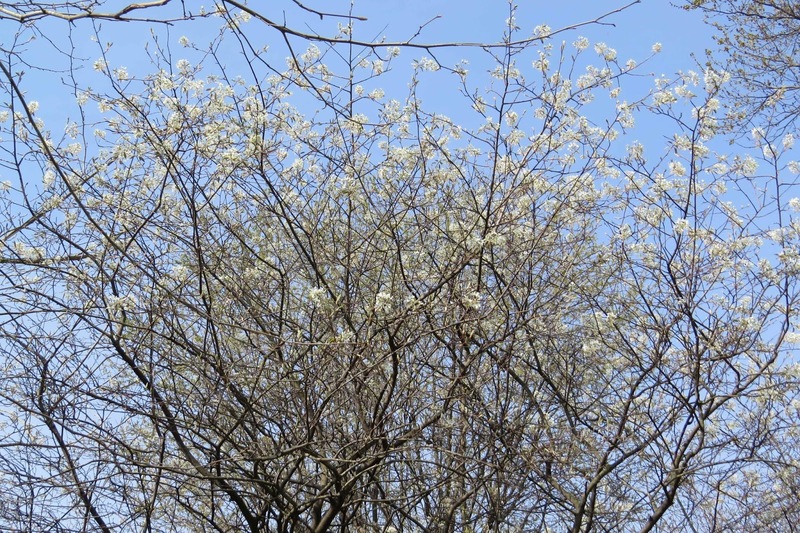 The Serviceberry tree is blooming up a storm. 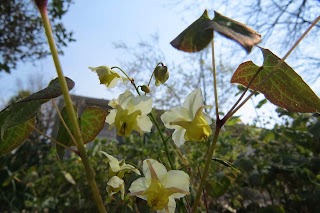 Epimediums are blooming nice now. 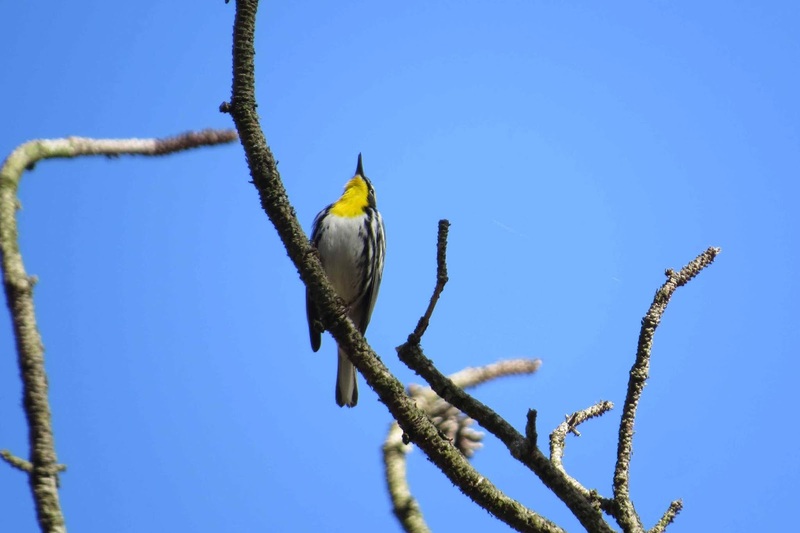 Last but not least the Yellow-throated Warblers are back in town staking out territories. 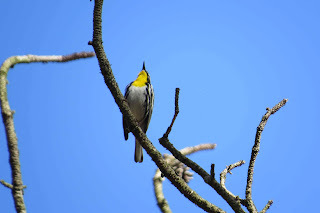 It is always such a delight to have them singing in the neighborhood. Clearly I need to snap out of it and get some things done in the garden. 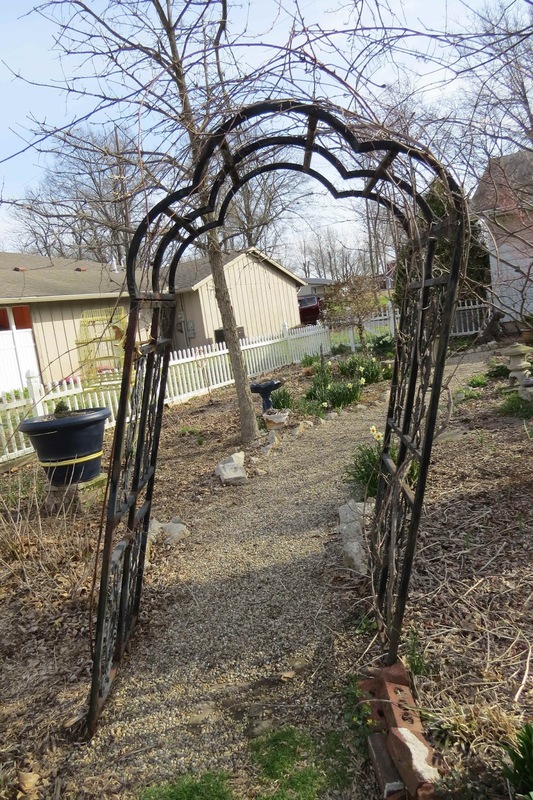 I hope you all are able to get into the garden now. If not now after the blizzard passes through. It takes a while to get over a vacation! As I sit here with temps around 30 and snow on the ground, all I can do is sigh looking at your pictures. It won't be as long as it has been Nan. Your garden will be popping in no time. Our daffodils seem to have lasted longer this year. 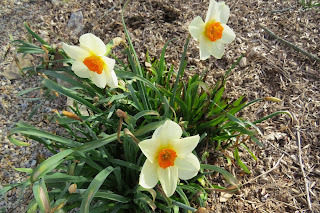 This has been the worst year for my daffodils. This month has been 17degrees warmer than last year they just said on the news. The weather is so topsy turvy you just never know. 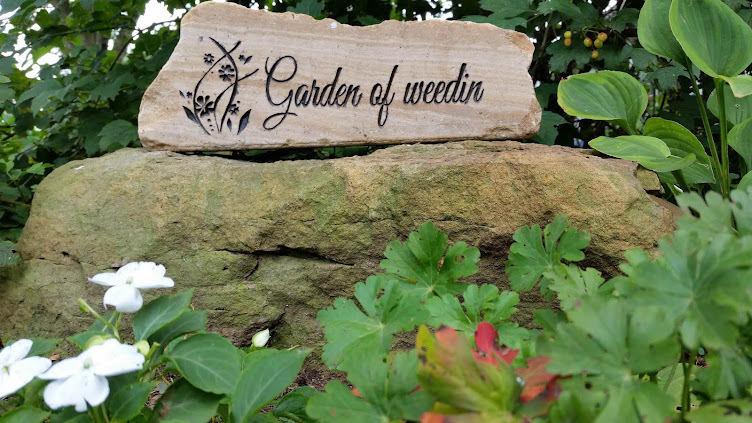 Aww sorry to hear you've been feeling a bit blog wonky, great pic though :-) All your images are a wonderful garden capture for now. It's aiways nice to see similarities from a different area of the world too. I love your spreading wildflowers and that warbler is quite stunning! After adjusting (pleasantly I hope) to a vacation schedule, I think returning to "real life" is always a bit of a jolt. 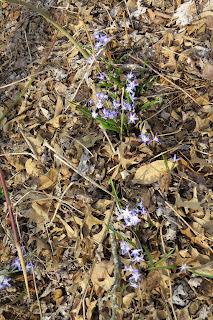 Luckily, your garden's rolled out the spring carpet to celebrate your return! 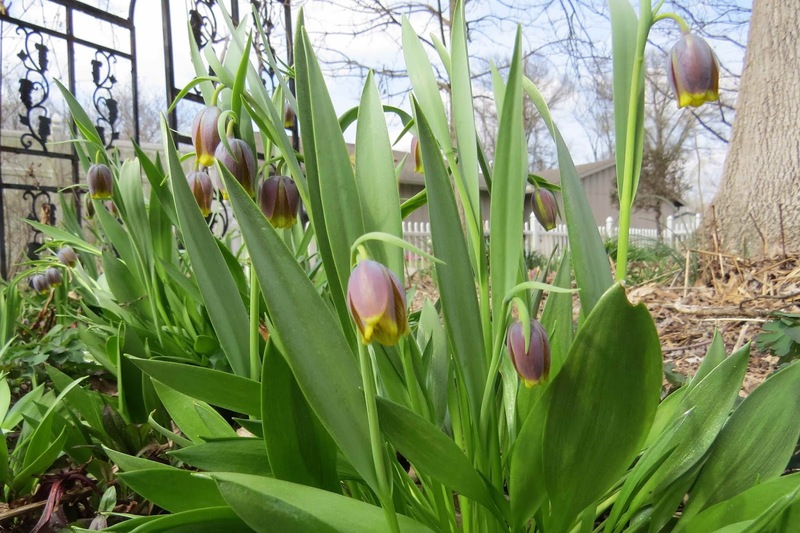 Seeing your photos gives me tulip envy - and hosta envy. That bright, yellow Hosta is nifty. 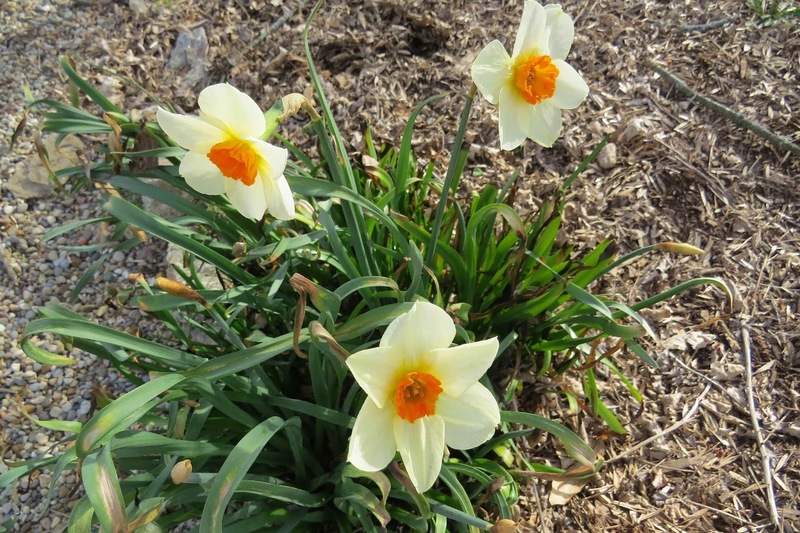 I've noticed similar damage to spring-flowering bulb plants because of extreme freeze-thaw cycles. Going back and forth between mild and brutal winter from January through mid-April has taken its toll. Still, spring has sprung! 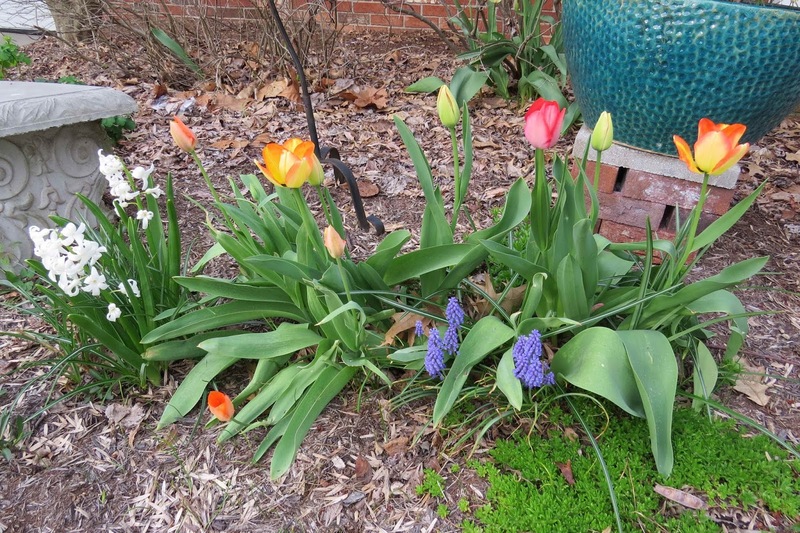 Beautiful blooms, Lisa! Where did you vacation? I was in Costa Rica for 2 weeks. I am trying to edit some of the 10,000 pictures taken so I can do a post about it. I am so busy in the garden I don't know when I will get all put together. Welcome back! 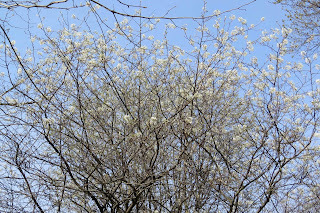 I am still wanting a serviceberry tree. I hear they attract cedar waxwings. I'm sure, your problems passed, Lisa and pretty flowers are blooming in your garden. Lovely hellebore! Lisa - I am sure after you shared your lovely photos of your spring garden you immediately began to feel much less off course. You are just a wee bit ahead of the season than here. I love the Helleborous - I was just out on the net shopping for them. Do they spread Lisa? I think they are so pretty. Well have a lovely spring weekend. Hugs! Wow ... Lisa you are so ahead of me .. 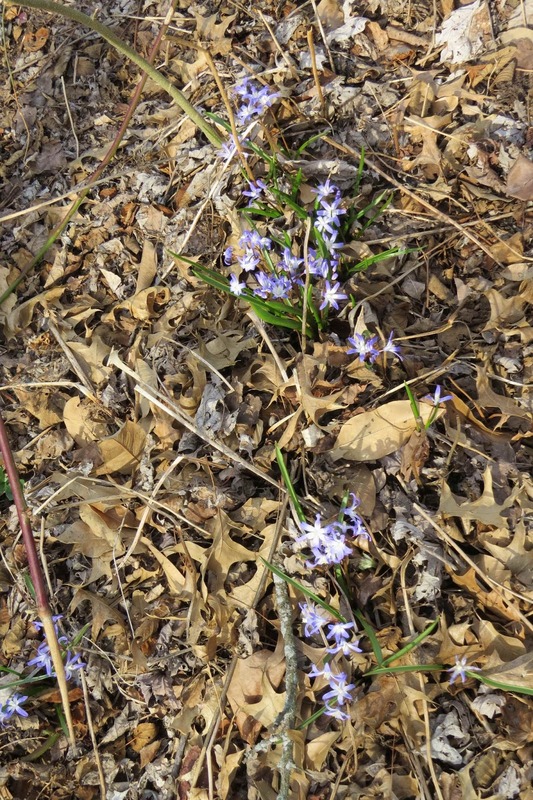 I feel like I am the last gardener on earth that will get anywhere with Spring blooms .. OK, the weather is improving a bit .. but clearly no where near your mark. Welcome home and what beauty awaits ~ gorgeous floral shots!